To make sure you get the best deal we'll show you great prices from all of our drivers, including G.F Vans , if they're available on the day of your move. Have a question for G.F Vans ? No problem, send them a message and they'll email you back as soon as possible. If you have a more general question you might find it answered in the FAQ, or you always contact one of our brilliant customer service team. * G.F Vans won't be able to see your email address. We can move anything from a single item / light removals to entire van loads. We have been in the transport business for twenty years, and work alongside some very large bluechip companies. Your goods will be moved in a safe and secure manor. We use blankets, transport belts and shrinkwrap where needed. 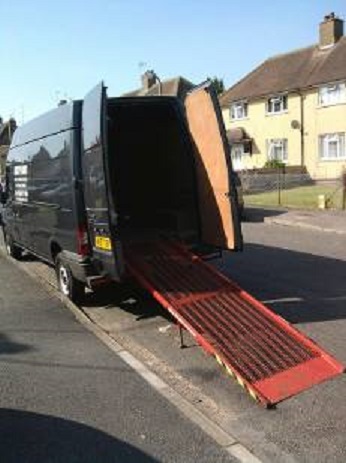 We also carry a heavy duty sack barrow and a heavy duty skate to move heavy items.The van has a large heavy duty fold out ramp for ease of loading the very heavy items. We offer a first class professional service. Great guy! Super polite and talkative, made us comfortable. Everything was really easy and all went smoothly.